The applet demonstrates one example of composite trigonometric curves. That is, the result we get from adding together different periodic (and non-periodic) signals. 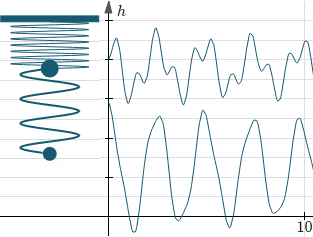 Very few signals in electronics are pure sine curves. Instead, they are a combination of DC (direct current) and AC (alternating current) signals and the job of any receiver (like your phone, TV or radio) is to split apart those combined signals into something useful. Apart from electronics, we come across composite trigonometric graphs wherever waves are combined (like ocean waves with smaller ripples caused by the wind, or eathquakes). In the case of the double springs applet, it is a system of differential equations (the motion of each spring affects the motion of the other one) and so each step needs to allow for the different forces and velocities that are going on. So for each step, the Runge-Kutta function accepts the current 2 velocities of the 2 masses, and outputs the next 2 velocities for the subsequent step.